PLANTING DATES: For spring, plant seed 3-4 weeks before the last average frost. For fall, plant seed 8-10 weeks before the average first frost. Plant transplants in late winter or very early spring. In general, plant seed. February 7 - March 10 and October 1 - November 30. Sets and plants - February 1 - March 17. For big onions, plant seed October 1 and transplants with 8-10 inch spacing in December. PLANTING METHOD: Broadcast seed or plant in rows ¼-½ inch deep. The small bulbs or sets should be planted in rows 1 inch deep. Set transplants in shallow garden soil. When using transplants, choose plants only ½ inch in diameter or less. SEED EMERGENCE: Shoots appear in 7-21 days. 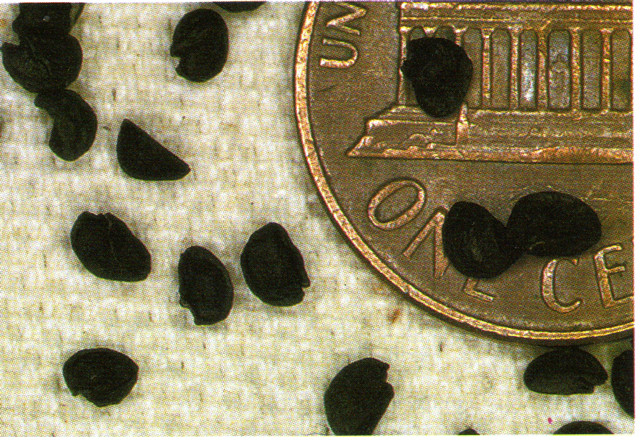 Seed germinate at 50-95°. HARVEST TIME: Harvest the green onions (scallions) at any time. Harvest the bulbs when the bulbs have swollen and the tops have died back. Sets usually take 35-45 days; seeds take 85-200 days. GROWTH HABITS: Cool-season bulb that has dark green strap-like foliage and bulb. Onions are related to lilies. They have round clusters of small flowers on hard stems. CULTURE: Plant onions in raised rows for best results. Soil should be healthy and well drained. Add lots of compost, lava sand, sugar, and organic fertilizer. Dairy manure can be used but should be tilled into the soil about two months before planting. Thin out plants to avoid crowding and use the removed plants to plant elsewhere or eat. Onions have small root systems so put the fertilizer close to plants and be sure to keep the soil moist - not too wet, just moist. Onion seed can be planted in the fall in well-prepared garden soil that’s full of compost, rock powder, and organic fertilizer. Onions will definitely start to grow before freezing weather. If it’s a relatively mild winter, freezes won’t severely damage young onions and they will take off in the spring and produce big, beautiful onion bulbs. During hard freezes, small onions can be covered with loose hay or floating row cover. Another method of starting onion seeds in the fall is to plant them in pots, but keep the small plants in a cool place, greenhouse, or well-lit garage until late winter when they can be set out in the garden without fear of freezing. That’s about the same procedure you use when you buy transplants from the nursery in the winter. Seed doesn’t cost much; give both techniques a try. Onions, leeks, and tomatoes need plenty of time to develop a strong root system. That’s why I start them so early. Cabbages, head lettuce, cauliflower, and broccoli develop quickly, and I can set them outside a week or two before the last spring frost. That’s the reason for their later start. My melons get only a short head start inside because I like to transplant them small. There’s less risk in disturbing their sensitive root system. 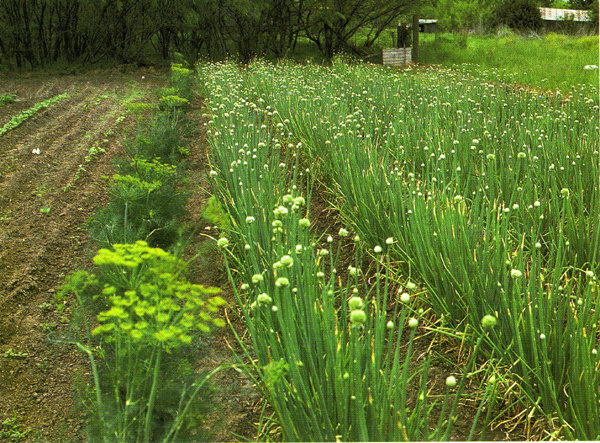 Ignore the rule about fertilizing at bloom time with onions because they don’t bloom until their second season. Fertilize them when they are 6-8 inches tall and every couple of weeks after that until the bulbs start to expand. Onions can take quite a bit of fertilizer. Give them plenty because the size of the onion bulb is determined by how much green top the plant has. Bulbs are made with energy stored in the green leaves. The more green top, the bigger the bulbs. Use 2 to 3 cups of organic fertilizer per 10 feet of row 16 inches wide. Don’t fertilizer onions if their tops have started to fall. TROUBLES AND SOLUTIONS: Damping- off can be controlled by planting in well-drained soils and avoiding overwatering. Crowded conditions results in spindly, weak plants. Slugs, snails, and cutworms are controlled with natural diatomaceous earth, cedar flakes, hot pepper, and/or fireplace ashes. Fungal and bacterial diseases can be controlled with a basic organic program. Thrips are controlled with the release of beneficial insect and garlic-pepper-seaweed sprays. HARVEST AND STORAGE: Some varieties of onions can be stored by leaving them in the garden soil. This can’t be done with garlic. When removed from the soil, store bulbs in a cool, dry place. They will keep for months. NOTES: Leeks are big onions that are often mistakenly called elephant garlic. All alliums are good eating and good for you. Onions should always be on your menu. Not only are onions delicious in soups, salads, vegetables, and on hamburgers, they are good for your health. Onion has the same, but lower, doses of garlic’s antibacterial and antifungal properties. Onions in the diet is said to reduce cholesterol in people with high-fat diets. They also can lower blood pressure and help keep arteries clean. VARIETIES: White Grano is a reliable early type. 502 Yellow and Grano are sweet, mild and earlier and a better keeper than 1015-Y. 1015-Y Other varieties include (Texas Super Sweet), Granex (yellow and white), Burgundy, later than Grano but a good keeper and Red Granex (red). For green onions try Southport White, Bettsville Bunching, White Knight, Crystal Wax, Southport Red Globe, and Torpedo Red Bottle.